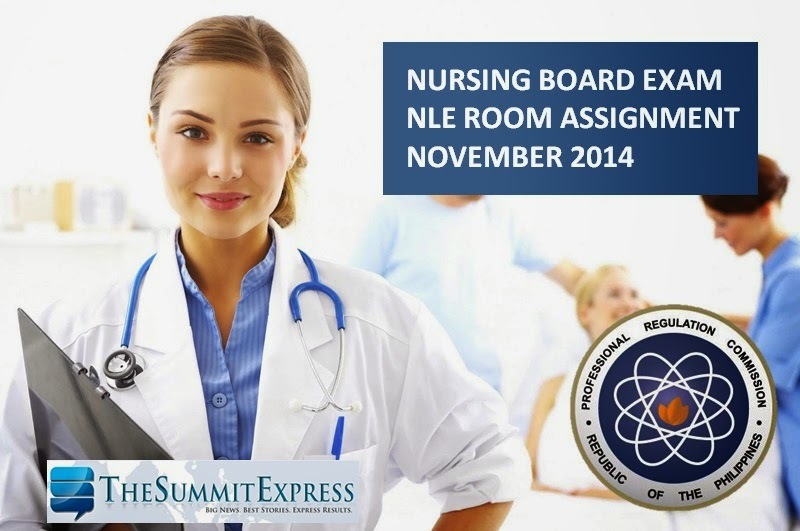 Those awaiting the room assignment for November 2014 nursing board exam or nurse licensure examination (NLE) may find here the updated room and school assignment as officially released by the Professional Regulation Commission (PRC) in one week before the exam. Nursing board exam will be given on Saturday and Sunday, November 29-30, 2014 in Manila, Baguio City, Laoag, Angeles, Cabanatuan, Cebu, Dagupan, Davao, Iloilo, Legazpi, Lucena, Pagadian, Tacloban, Tuguegarao, Zamboanga, Cagayan de Oro (CDO) and Bacolod. Like Us on Facebook or follow-us on Twitter to receive updates related to nursing board exam. We also deliver news via RSS Feeds or E-Mail.